For a tooth that is severely damaged or decayed, our team may recommend a restoration called a dental crown. Crowns are very versatile restorations that can be used for a variety of cosmetic and restorative purposes. Because each dental crown is custom made, you can rest assured that yours will fit your smile comfortably and aesthetically. To learn more about how a crown can improve your smile, we invite you to contact the Smiles Dental office nearest you! 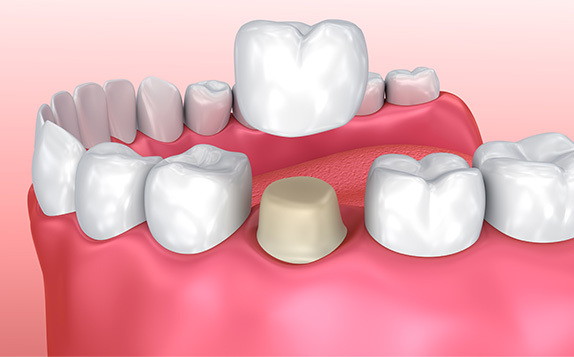 A dental crown, or cap, is a restoration that can be used for a number of purposes. One of the most common uses of a dental crown is to restore a tooth that is significantly damaged or decayed. The crown is custom made to fit over the entire tooth, starting at the gum line, in order to restore the tooth to its original shape and size. Dental crowns can be made of gold, porcelain, or porcelain fused to metal; porcelain crowns are popular because they match the natural color and appearance of your teeth. Our dental team will help you determine which type of dental crown is right for your smile. Your smile may benefit from a crown if a tooth is damaged or decayed to the point that a dental filling will not provide a successful restoration.